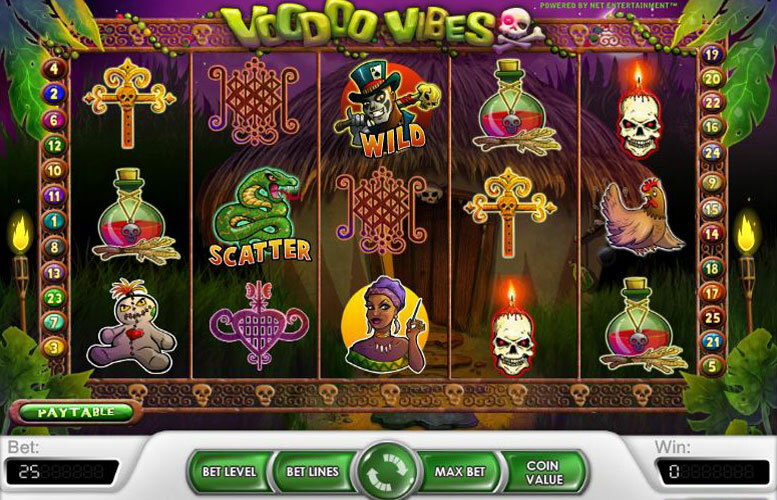 Trigger the bonus feature on Voodoo Vibes and stick pins in the voodoo dolls to reveal big cash prizes! But don’t worry if you don’t trigger it there’s still a 90,000 coin jackpot to play for and the chance to get free spins thanks to the scatter. This game is a 25 payline slot machine that sends players into the jungle to win some cash from a wild Voodoo priest and his friends. Frogs and bugs can be heard in the background and the priest will let out a deep, almost evil sounding laugh for any combination he completes. The rest of the symbols have what we would describe as a bone xylophone sound, aside from the scatter that hisses (it’s a snake icon). 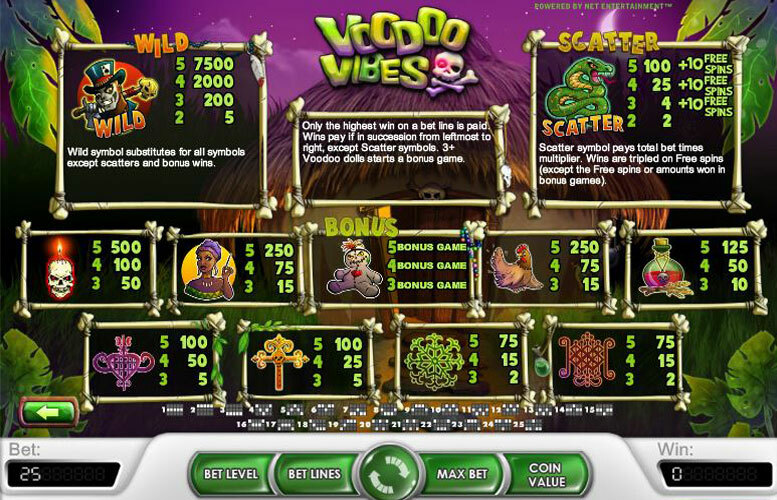 There is a voodoo bonus game that allows players to pick up bonus prizes out of the stuffing of voodoo dolls, but can only be activated by three or more bonus symbols on a payline. The top payout at the maximum bet is 90,000 coins, which is only available when playing bet level 4. To win the top payout, players first need to place bets at the maximum bet level. This is done by using the ‘bet level’ button and betting 4 coins on each of the 25 lines for a total bet of 100 coins. Players who manage to spin five of the wild voodoo priests on a payline (worth 7,500 coins usually), when betting four coins per payline, will get a payout of 30,000 coins… do this during the free spin rounds where wins are tripled and you’ve got the 90,000 coin jackpot! Using this same credit bet, players can also win the second highest jackpot, which comes from spinning five of the scatter snakes to get 100 times the total bet along with ten free spins that have tripled wins for regular payouts. This payout is worth 10,000 as the scatter reward plus the amount won in the free spins. The coin payouts listed below are the value paid at bet level one. Multiply these by 2, 3, or 4 to find the payouts for various bet levels. Bonus Symbol: This cute little voodoo doll is also a little creepy looking and getting three or more of them on a payline will activate the voodoo doll bonus feature. In the feature, players click one the 12 dolls one at a time to reveal either a bonus amount or an empty doll. There are three dolls that are empty and hitting one of them will end the bonus feature. The other nine dolls contain various rewards that can result in getting a pretty good payout from the feature. Scatter: The scatter (snake) will hiss when it is a winning combination. Three or more snakes anywhere on the reels will grant the player a multiplier to their total credit bet and 10 free spins where wins are tripled. Five are a 100x multiplier. Players will get 25x, 4x, or 2x for four, three, or two scatter snakes on the reels respectively. Wild: The voodoo priest will pay 7,500 coins for five on a payline and 2,000 for four. Three wins 200 coins and two pay 5 coins. He will also complete any other combination except for the scatter and bonus. Skull Candle: This creepy decoration will pay 50 coins for three, 100 coins for four, and 500 coins for five in a row. Voodoo Lady or Chicken: These two pay out in equal values. Players win 250 coins for getting five matching on an active payline. Four matching pay 75 coins. Three matching in a row will pay 15 coins. Potion: Whether it’s to control someone or kill them is unknown, but the potion will pay 10 coins for three and 50 coins for four in a row. An award of 125 coins is paid for five. Pink heart shape or Yellow cross shape: Players can win five coins, 25 coins, or 100 coins for getting three, four, or five matching in a payline, respectively. Green snowflake shape or red shape: The final two icons also pay out in equal values. Five will pay 75 coins. Four award 15 coins. Three are the smallest payout with only 2 coins. Players can bet choose their paylines, which range from 1 to 25 lines that cross the reels. Players have four bet levels to choose from, which is the number of coins they want to place of each payline. This makes the total credit bet range from 1 to 100. The coin values for this game are 0.01 to 0.50 coins. The minimum total bet is 0.01p and the maximum total bet is £50. Players need to place bets at the maximum bet level in order to get the highest payouts that have the most value. This is then multiplied by coin value to create total win. This game has a rating of 3 / 5 with 200 total reviews by the users.